It’s actually kind of an enjoyable refreshing cocktail, if a little sweet. I did a little searching for some background, history, etc. Nada. 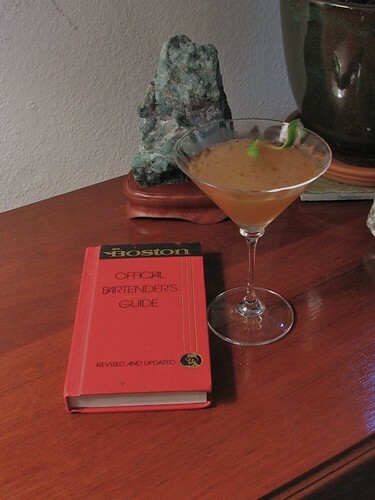 I mentioned none of the books in my modestly extensive collection seemed to even mention this cocktail. I even have Ted Saucier’s Bottoms Up! on loan from the university library. It is in CocktailDB.com and I found a reference on Liquor is Quicker. Both mention that the recipe should contain Old Tom gin rather than London Dry and the ratios are slightly different. DrinkSnob (author of Liquor is Quicker) also mentions that he found the recipe in David Embury’s The Fine Art of Mixing Drinks. I think I might have to look into getting a copy of this one. Original copies (either from 1948 or 1958, seem to be going for hundreds of dollars, but recently Mud Puddle Books has reissued it with what appear to be introductions by Robert Hess and Audrey Saunders (of Pegu Club fame).